Ahead of most of us in the race of „who bought the most cars in the last two years”, Göbi is the real techno-pro of the mother magazine, totalcar.hu. 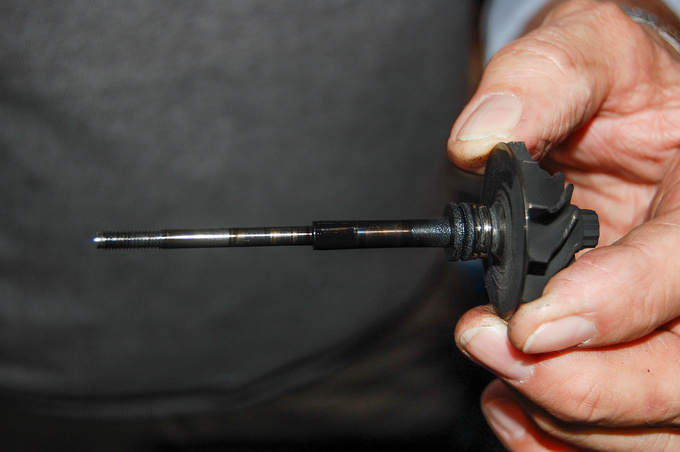 He has an engineering job at a motorcycle brand, so he makes up for time the lost time with Torx screws in his garage, which is as clean as a pharmaceutical factory. A nice VW Bug came up in the ads with Porsche suspension? He buys it and tunes it to 146 PS. A green, bog-standard Bug is on sale in the neighborhood? He collects that too, restores it. What about a nice Fiat 127? 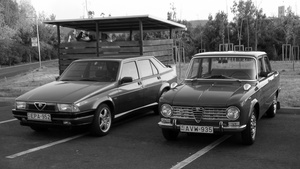 An as-new Merc W124…? And his technical writings are just as precise as his passion for cars – they steamroller the readers. One million kilometres, what’s the big deal? There are multiple things you can personally do to keep your turbo healthy and alive, and to make your reconditioned unit last as long as the original one. There is a contemporary trend of downsizing nowadays which is leading to more and more engine failures. This trend favours small capacity turbocharged engines. Turbocharging is needed for an obvious reason: turbos provide a better degree of charge, giving the engine higher specific power. However, these contemporary turbos are about half the size of those used two decades ago. They now rev up to 250,000 a minute, as opposed to 80-100,000/minute back then. Smaller weight means smaller inertia and thus, less turbo lag. High rpm, on the other hand, demands precisely engineered and manufactured bearings, high-precision assembly and an exacting balance. All of these mean however high manufacturing costs and proneness to failure. 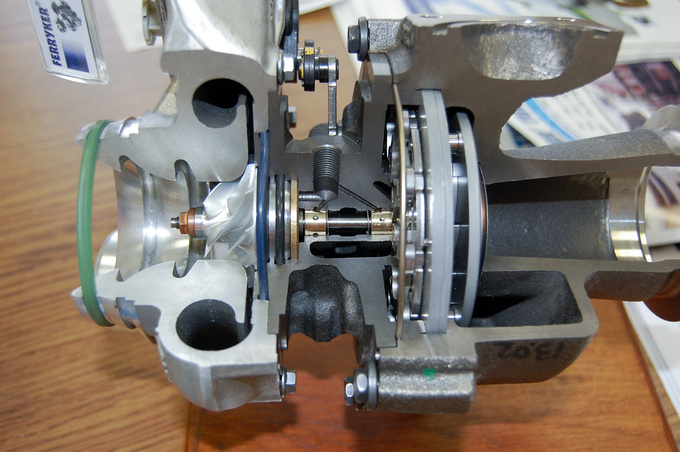 Modern turbochargers – small sized and fast-revving – usually employ journal bearings and oil cooling, meaning there is no need for a separate water circuit. Instead of regular journal bearings turbine shafts are equipped with floating journal bearings. These bearings - both on the outside, on the housing; and inside, at the shaft - run on a thin film of oil, so when optimal hydrodynamic lubrication is achieved there is no metal-on-metal friction, only fluid friction. 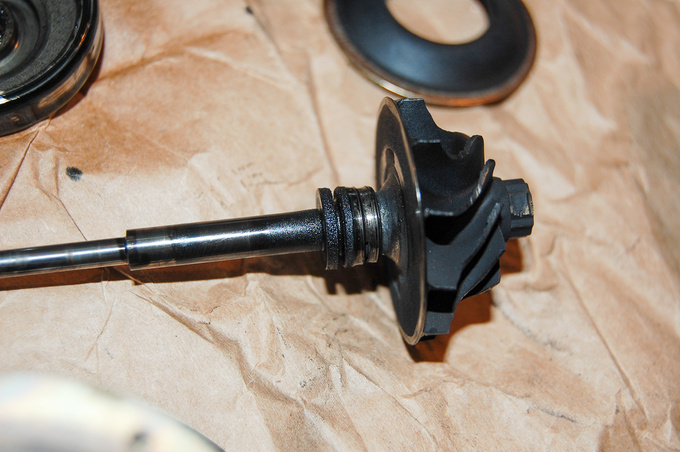 This is necessary because, without cooling the bearing from both ends, the rotating piece would overheat too fast. 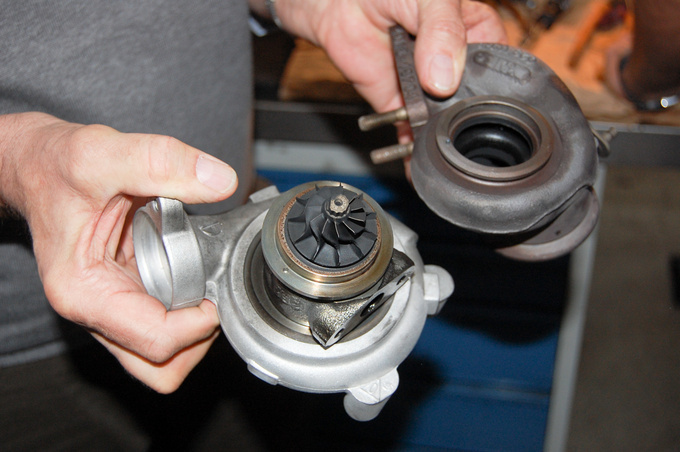 Heating and cooling are two fundamental concerns in the operation of a turbocharger; the third being the lubricant. Once oil pressure and volume flow rate are built up to an adequate level within the turbocharger, there is optimal hydrodinamic lubrication, resulting in negligible wear. 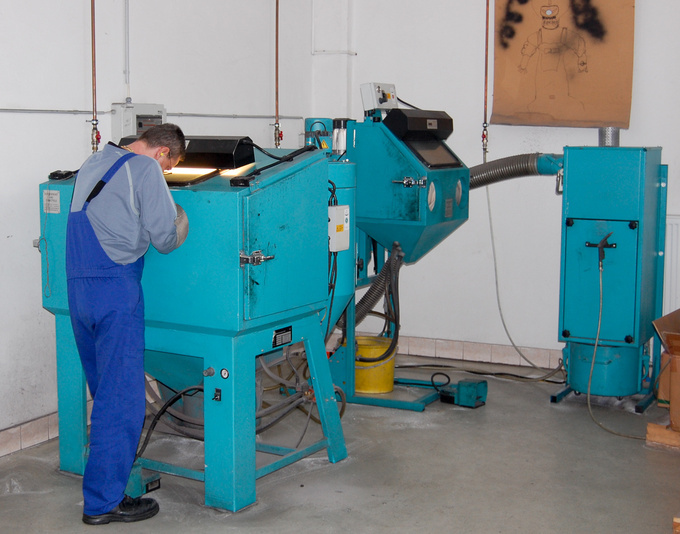 The reason is there is absolutely no metal-on-metal friction; oil mediates between the stationary and rotating parts. Of course oil deteriorates in time and needs to be replaced. Hypothetically a turbocharger should live much longer than the engine driving it with its exhaust gases. Hypothetically! However, real life is altogether different. 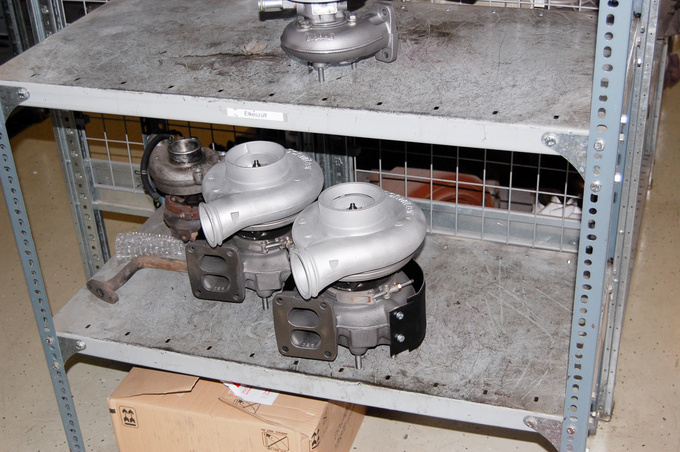 Turbochargers usually fail relatively early and their failure is almost exclusively due to an operating fault. Analysing the most common causes you will find that, more often than not, failures are related to lubrication: either to the inferior quality of the oil; or to the complete lack of oil at the place of intended lubrication: the journal bearings. The quality of oil is important for two main reasons: to provide adequate performance levels, and to ensure proper viscosity. Performance level is not only important in relation to the additives in the oil. There is correlation between soot generation, the cracking of the oil, the disintegration of its carbon chain structure and its performance levels. Fill your turbocharged engine with an inferior quality, lower performance oil, and negative consequences will invariably include damages to the turbocharger. If you choose some cheaper mineral oil instead of a synthetic one it is bound to have lower heat tolerance. And this means that when the heated turbine shaft meets the oil film, the edges of the latter will heat up to a degree where oil begins to burn. This generates soot which burns onto the shaft, right under the sliding surface of the bearing. This, in turn, will reduce the bearing gap, block the free flow of oil, causing the bearing to run warmer. What you see here is a self-aggravating process which invariably results in the bearing getting either stuck or completely worn. As a result the turbine will no longer run coaxially with the turbo housing, vanes will begin to touch the housing and get shredded down. This is a highly typical fault caused by a poor choice of lubricant. Just as important as the quality of oil is the proper volume flow rate of oil within the turbocharger, over the bearings. I didn't say oil pressure but volume flow rate on purpose because you can have oil pressure if the returning oil tube in the turbocharger gets clogged or narrowed some way. This however puts the oil up at a dead end street. There will be no oil circulation, the lubricant will overheat and generate soot – and so forth, as described above. When I once disassembled an almost brand new, yet failed turbocharger that had been installed on a used vehicle I could immediately see the problem. The shaft was covered in soot, while both the front and the rear end of the journal bearing was scratched and worn. There was no trace of oil on either the turbine or on the compressor wheel but the latter was already touching the housing and had begun to wear it. All of this meant a rather expensive repair as we had to replace the entire housing, not just the central section, because if you put your new wheel into the old, worn out house you will have too wide a gap and efficiency would be poor. This damage was clearly caused by insufficient lubrication. 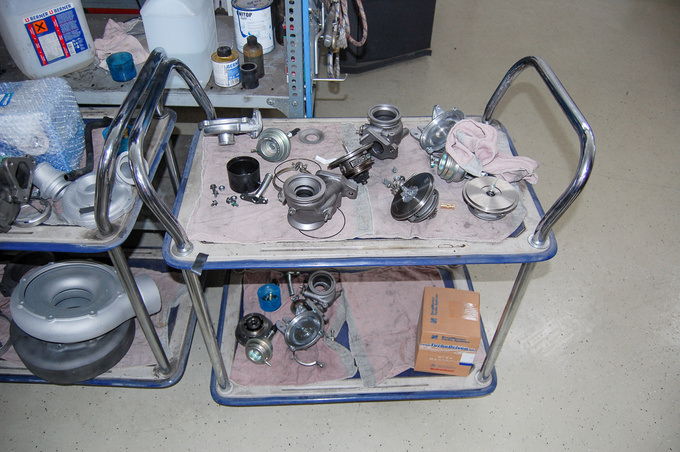 Either someone floored the accelerator pedal during assembly, before oil pressure could built up, resulting in the turbocharger running practically dry; or oil feed / drainage was not sufficient, resulting in a lack of lubrication or low volume flow rate at the bearings. 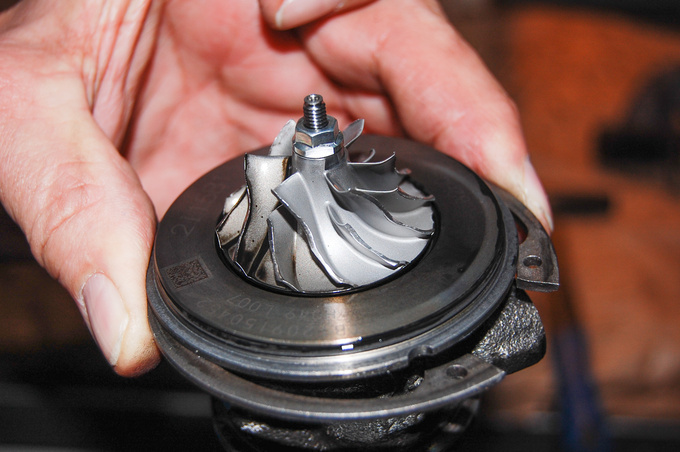 Why the turbocharger needs cooling is obvious: its shaft gets so hot under heavy load that, with the oil pressure gone (because you have killed the engine), stagnant oil will be rapidly overheated, thereby propagating soot formation. However it you let the engine run just a little while longer, the 100°C lubricant will quickly cool down the much warmer shaft and bearing. You want to keep the oil from being heated to the temperature point where cracking could occur. That temperature should never be reached, not even locally, in smaller volumes. When you drive flat out on the highway or tow your caravan up a steep incline, the turbocharger will heat up. If you shut down your engine right away, that'll take a heavy toll on your turbocharger seriously reducing its life expectancy. That is probably the single worst thing you could do to your turbo. If you want to help it survive you can engine break you way to your final destination: this feeds the turbo plenty of oil yet it does not have to do any work, and will subsequently cool down instead of heating up. Even better if you can operate the engine at idle for half a minute. That means oil pressure is less but still adequate ensuring a proper cooling down of the turbocharger. Mind you, this does not mean it will be cold. Touch the housing and your fingers will sizzle as they fry on the hot metal. But the bearing inside the housing will be no warmer than 150°C and that's all that matters. If you have a car equipped with start-stop, worry not. You will rarely arrive at a situation where heavy engine load is immediately followed by the computer stopping the engine. If you want to protect your turbocharger, use high quality oil, keep lubrication, oil feed and discharge lines clean and make sure crankcase pressure isn't too high because that could inhibit the back flow of oil. Also, don't allow anything to enter the turbocharger. After subjecting your engine to extreme loads, let your car slow down with engine braking and then after stopping let the engine run another 30 seconds. Do all of that and you will not be giving much work to turbocharger repair workshops. Miss any of these and your turbocharger will be short lived. A European capital in the Eastern Bloc. We’re in the 60’s. Poorly dressed people, gloominess, dilapidated trucks and state-owned Volgas. But the high-tech DOHC engine’s boom of this very car is already reverberating from the walls of the old houses.